I lived in Copenhagen for a bit more than a month when I learned that Aarhus, important port and the second largest city in Denmark, will be one of the satellite sites for Darsana anomaly. I planned to visit this place eventually and participation in the anomaly seemed like a good excuse. However, I had some reservations. At the time, I was at the level 3, and I knew I wouldn’t be very useful in the battlefield. I also had no experience from previous anomalies, so I didn’t know the practicalities of it – who goes where, who does what, who decides? Can you just show up and participate? Badluck13 gave some useful tips, such as: start with G+ community and join G+ event for the satellite site anomaly in Aarhus. This first step turned out to be very important, but it wasn’t easy for me, for two specific reasons. First, I usually don’t use G+ other than for Hangouts communication with a couple of people and for photo storage – so, I have a hard time navigating the app and I’m not too excited about learning what’s where in their system. That sounds like a petty excuse, but it really is more difficult to start communicating when you need to master the communication tool first. Second, I never met anyone through Ingress. I knew Badluck13 before it all began, so he doesn’t count. During the first year of Ingress I just watched him play; then I started playing a little, but around the same time moved to another state and kept moving ever since. As a low level agent I didn’t draw attention in the field, I stayed in foreign countries where I didn’t understand the local language which most of the agents used in COMM, and since I never started communicating with anyone from Ingress community first, I stayed alone. So there I was, with no powerful bursters, no experience and no contacts, about to go to Aarhus. I finally and officially signed up for participation in the anomaly only couple of days before it took place. The final step in the registration form was to name an agent who could vouch for me – confirm that I’m serious about this. The only person I could name was, you’re guessing, Badluck13 – which turned out to be a bit of a problem since we’re not the same faction – he’s in the Resistance while I stand with Enlightenment. Nevertheless, I registered, and soon learned how serious of a game the anomaly is. I booked my ticket and a hostel, and I was on my way. In the meantime, nobody from Aarhus contacted me. At least that’s what I thought. One person from Belgium tried to reach out via COMM, pinged me and asked for contact via G+, but I had some trouble figuring out how to send a private message through G+ app and never got back to them (my fault, I know). I arrived in Aarhus on the day before the anomaly and went for a walk, to see the sights and collect some items. I still had no clue what’s going to happen tomorrow and how am I going to participate, if I can participate at all. Badluck13 encouraged me to write a message on the faction chat and tell people I’m there, and so I did. And someone wrote back, recognizing my nickname from the application form I submitted. “So they really read those!” – I thought, impressed. I still had no clue what kind of planning went into all this. At one point, after hacking one of the enemy portals, I sat on the square to rest and to wait for the portal to cool down so that I can hack it again. When I was about to do so, I saw it went grey – and just 5 minutes ago it was level 8. Someone else was there, apparently. And then I met him: Razerian, one of the hosts – as it turned out – wore a hood in the color of Enlightenment faction and correctly assumed that I was RightToTheCity, agent who messaged everyone earlier that evening. He was on his way home, and wondered why I never got to his event which took place earlier that evening for the agents already in town (OK, I do realize that I seriously need to learn how to navigate G+). But he didn’t leave me hanging: he tried to figure out what team I was on, and other details important for anomaly participants. He sorted through Google Drive documents and concluded that I was not on any of the lists, so he needed to investigate what happened with my application. We decided to keep in touch via Hangouts and went our separate ways. An hour later I got a COMM message to check my Hangouts invites. I did, and there they were: three invitations from three people of Enlightenment team involved in organizing satellite anomaly in Aarhus, all tried to reach me over the last couple of days. My hangouts settings were – apparently – made not to show invites from the people I don’t know, and so I missed all of the organizers’ attempts to get in touch with me. What a shame. Anyway, I responded and the host I’ve met that evening connected me with the rest of the team, most importantly with DrKaosDK – the chief executive of the whole operation, it seemed, and HS235dk, the leader of the Cluster Team to which I was assigned. We chatted about practicalities – they were glad I came, I was glad I found them, and we were all excited about Darsana that was about to take place the next day. 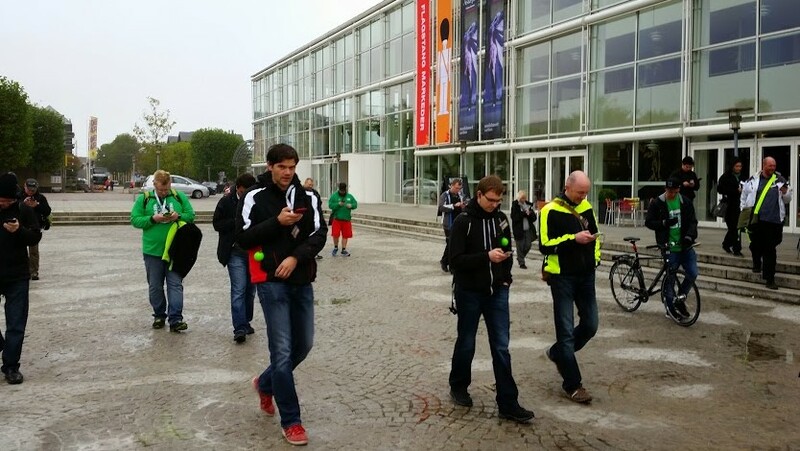 When I got to the meeting point on Saturday, October 18th, the space was already occupied by many Ingress agents proudly wearing green. The agent who carried the flag of Enlightenment faction made sure everyone finds the rest of their team, so I got to meet my mates right away. We all got closed envelopes – some people found a badge inside, some stickers, and some got gift cards. DrKaosDK made a short speech, explained how the day is planned and conveyed greeting from Niantic. When the official introduction was over, we had a brief team meeting, to figure out who does what. As HS235dk suggested, I was to become “a designated shielder”, since my low rank could not obstruct me from deploying shields. I had some necessary items for this task – I managed to collect some rare and very rare shields over the last month – however, it wasn’t enough, so the other team members dropped some of their items for me to use in the battlefield. After these consultations, the whole faction moved towards the park where we were about to meet the Resistance. Wearing all shades of blue, they appeared on time. After the group pictures were taken, it was time for anomaly to begin. Darsana was exciding! For most of the people on the cluster team, this was the first time to participate in such event. We split in groups of two or three to protect assigned portals from the attacks; we were usually outnumbered by the attackers and our faction did not win any of the four measurements during the anomaly, but it was pure, engaging and energizing fun. Freedom4tw and I would have a cigarette during the breaks, it felt good, following the whole excitement induced by the measurement. At one point, during the second half of the anomaly, my external battery died – but it wasn’t a problem because Freedom4tw could lend me his (good thing that Ingress agents always carry additional powered sources). At the very end, I had no XM and no powercubes, and I learned right there on the spot, while we were trying to keep the volatile portal on our side, that I can get XM by recycling inventory items. I really didn’t even know how much I didn’t know before Darsana. We managed to keep that portal. I achieved level 4. We didn’t win the anomaly, and even if we did, my contribution would be marginal. 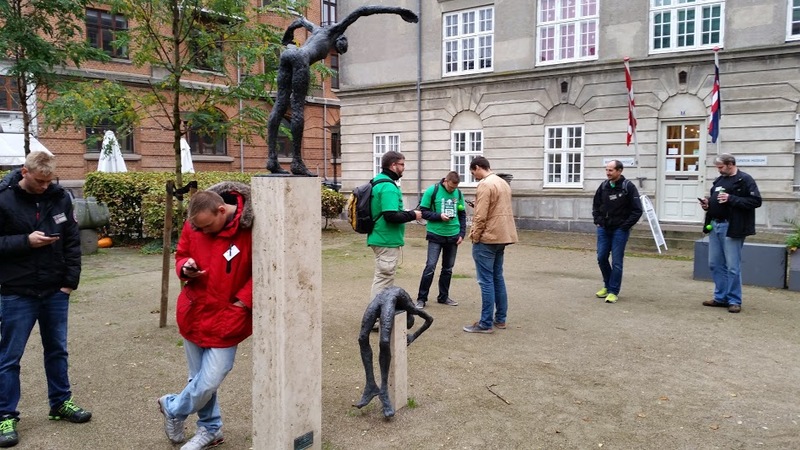 But people taking care of Ingress community in Aarhus took me, at level 3, seriously enough to spend substantial time trying to get in touch and then, in the very last minute, made me a productive member of one of the teams. “Every player matters,” HS235dk told me firs time we had a chat. For a game that revolves around collecting XM and capturing portals, Ingress could not be more human than it was during Darsana in Aarhus. I really hope that people elsewhere are working on organizing anomalies as hard as Enlightenment agents in Aarhus do. A shot out to all of them: DrKaosdk, HS235dk, GalaRen, alyore, morten8541, Razerian, bckuhn, knoldesparker, Yaliena – kudos for a job well done! Also, I’m guessing there are some amazing people who worked on this for the Resistance faction, but since I never met them I cannot name agent names. Now I play Ingress (almost) daily, and I’ve achieved level 7 – almost 8 actually, mostly thanks to some joint actions of Copenhagen Enlightenment Team and the double APs granted to us this November. Ingress is a real fun when you get to know some people, and even more so when your bursters get stronger. For me everything really started in Aarhus, so when in doubt – attend anomaly! Regardless of your level. Happy hacking! Exploring European cities, at the moment. what a lovely story. I am an RE Agent who lives in New Zealand, near Dunedin. What a wonderful bunch of ENL agents who took you in tow, We all found out that we had a lot to learn when we first started playing. An Anomaly Event seems to have been the almost perfect place for you. I imagine that by now you are L8 and getting more and more addicted day by day. I have made so many new friends through playing, friends in both factions. Keep on having fun and find out what nice people there are on the “other side” too. Can’t wait for this years anomaly; it’s gonna be my first!! I remember that evening. I had just said bye to Pacifica who was the only other agent who came to the event i had made, and was considering if I should go greet the smurfs that was destroying my newly claimed portals. Then I noticed on the scanner a portal going green-grey-green, and of course I had to see who it was who had ventured out in town that evening. I actually felt a little bad leaving you before finding out why you weren’t on a team, but I knew I had to get a hold of DrKaosDK to get it solved as fast as possible. Luckily we had an amazingly dedicated group of people, both among those in Aarhus and the many from other towns who assisted us in getting this event up and running, that we easily got you into one of the teams and ready for the anomaly. I’m glad to hear you’re still going strong in the game, and if you ever visit Aarhus again make sure to let us know so we can meet up and turn the town green. We in the Resistance take Anomaly planning pretty seriously. I participated in Helios. Great time. Looking forward to more in the future. Congrats on your leveling up. All and all, Ingres is all about friendly competition and making new friends/connections. Regardless of faction.